The Auschwitz Institute for Peace and Reconciliation (AIPR) recognizes Tuesday, July 17, 2018 as the annual Day of International Criminal Justice. 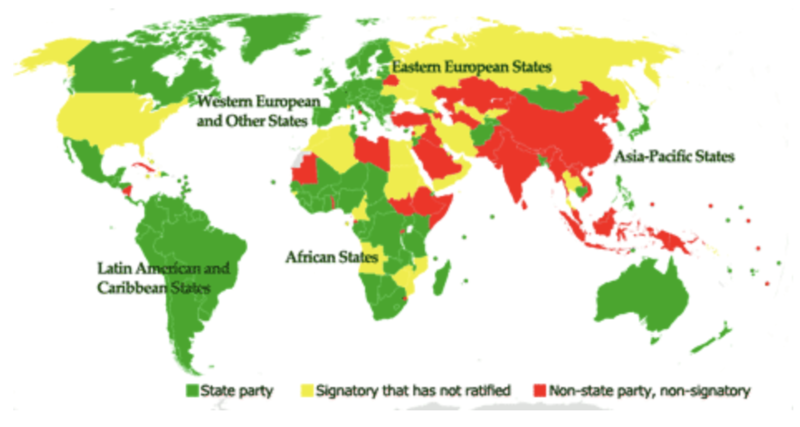 This year’s observance marks the 20th anniversary of the international community’s adoption of the Rome Statute, which entered into force in July of 2002. The Rome Statute established the International Criminal Court (ICC) as a permanent body. Located in The Hague in The Netherlands, the ICC is dedicated to ending impunity in grave criminal matters and holds a mandate to investigate and try individuals charged with genocide, war crimes, crimes against humanity and the crime of aggression. At the moment, the ICC is currently housing 11 investigations, with a total number of 26 cases before the Court. 123 states from across the globe are currently party to the Rome Statute, with El Salvador most recently joining in March of 2016. The ICC employs more than 800 individuals from approximated 100 countries and operates in 6 official languages, with French and English serving as working languages. Today, July 17, 2018, is also the activation date for the ICC’s jurisdiction over the crime of aggression. The crime of aggression is defined as “the planning, preparation, initiation or execution, by a person in a position effectively to exercise control over or to direct the political or military action of a State, of an act of aggression which, by its character, gravity and scale, constitutes a manifest violation of the Charter of the United Nations.” More information on can be found here. The decision to active the crime of aggression was made during the Assembly of State Parties’ 16th meeting, held in December of 2017 in New York. In addition to activating the Court’s jurisdiction over the crime of aggression, the Assembly also amended the Rome Statue to add crimes related to “employing microbial, biological or toxin weapons; employing weapons that injure by fragments undetectable by X-rays; and employing laser weapons” to the body’s purview. On this Day of International Criminal Justice, the Auschwitz Institute reiterates its support for the efforts of the ICC and other bodies of international justice working to end impunity and increase measures for accountability in cases where international law is violated. AIPR welcomes the addition of the crime of aggression to the ICC’s jurisdiction as an additional tool in the fight against global violence and risk factors that enable genocide and other mass atrocities.